Kollam District has everything that Kerala has to offer - sea, lakes, plains, mountains, rivers, streams, backwaters, forest, vast green fields and tropical crop of every variety both food crop and cash crop, which is why it is called God’s own capital. Kollam is located on the edge of the famous Astamudi lake, making it a gateway to the scintillating backwaters of Kerala. The Sasthamcotta lake, the only major fresh water lake in the State, is here. Two other major lakes are the Ashtamudi kayal and the Paravoor kayal. Edava and Nadayara kayals lie partly in this district. Places to visit here are many – the Palaruvi Falls, Thenmala (forests and reservoir), the Agasthyamalai Biosphere Reserve, Ashtamudi (backwaters) and Kollam beaches (Kollam city beach, Thirumullavaram beach, Thangassery beach) are all beautiful spots in this area. Thenmala, located 66 km east of kollam, is the first Ecotourism project in India. This project is run by Thenmala Ecotourism Promotion Society. 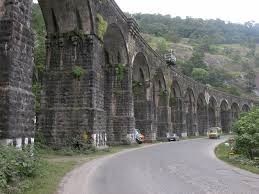 Polachira in Chirakkara Gramapanchayat is a beautiful place for site seeing. The famous "Anathavalam" is near here, where one can see domestic elephants even ride on them. Don't forget to see "Mannathippara" at Polachira. It is 4 kms towards south from Chathannoor town. The famous Varkala Beach, also known as Papanasham, is 26 km south of Kollam. The church in Malankara is an integral part of the Universal Syriac Orthodox Church with the Patriarch of Antioch as its supreme head. Apostle Thomas founded one of his "seven and a half churches" in Kollam. Kollam was the seat of the Desinganad kings. Kottarakara is famous as the place where the classical dance form of Kathakali was conceived. Thenmala is the first planned eco-tourism destination in India. The Thenmala dam was built across Kallada River. Thenmala attracts foreign and domestic tourists with a host of attractions. Boating on the lake, a rope bridge, trekking, mountaineering, biking and a musical fountain. Thenmala is approachable both from Trivandrum and Punalur by road. The waterfall called Palaruvi – literally ‘river of milk’ – is a prime attraction nearby. Aryankavu – Pilgrim centre just about 5 kms from Palaruvi waterfalls. The temple has some fine sculptures and mural paintings. A huge rock that is named after a mythological hero Jetayu from the epic, Ramayana. It is believed that Jatayu, a giant bird, fell after failing in its attempt to stop Ravana from abducting Rama’s wife Sita. The rock is ideal for trekking by the lovers of adventure and offers excellent prospects of an exhilarating hang-gliding experience. The Ashtamudi Lake, so named because of its eight 'arms' or channels, is the gateway to the backwaters. Mata Amritanandamayi Ashram, a spiritual trust with a large number of educational, technical and healthcare industries is headquartered at Vallikkavu, near Kollam. Alumkadavu, a small village near Karunagappally in Kollam is a major boat building centre specialising in house boats. Houseboats are huge country boats, with about 67 feet in length and a width of around 13 feet in the middle. These are made by the country craftsmen using local and eco-friendly things like wood, bamboo poles, coconut fibre etc. A seaside town near Kollam, Thangasseri is a beautiful place on the shores of the Arabian Sea. Thangasseri beach is one of the most beautiful beaches of Kerala. For all you nature lovers who search for serenity and seclusion, Thangasseri is the perfect beach retreat. Thangasseri has a 3km long beach, an old lighthouse and age old ruins of the Dutch empire. Thangasseri also has some 18th century churches. Thirumullavaram Beach is a very famous tourist destination. Thirumullavaram Beach is located 6 km north of Kollam town. The most interesting concept of this temple is its acceptance of anyone who is seeking shelter and help. Ochira stands out to be one and only example in this century to be a place for those who seeks God through service and open heart. The concept behind this temple is very simple: God exists everywhere, you seek God through service. Thanks for Sharing this with us! Kollam is an excellent tourists destination in Kerala, visited by tourists from all over the world. There are lot of sightseeing destination around Kollam that includes : Thirumullavaram Beach, Mayyanad, Neendakara, Ochira, Sasthamkotta and Karunagapalli. Tourist across the seas comes here to visit the amazing location and for many travelers who prefer to stay at Resort in Kollam.